Squat thrusts and jumping jacks can help you reach the results you desire. Some people will do anything to get in shape -- from intense and ill-advised diets to extreme workout programs. You don't have to adopt any such plan to get fit; using familiar and functional exercises such as squat thrusts and jumping jacks can help you improve your figure dramatically. Always consult a medical professional before beginning any workout program to ensure that it's appropriate for you. Squat thrusts, also known as burpees, provide an intense workout for your muscles. As the "Washington Post" notes, this exercise combines the squat and the pushup, making it effective for building the muscles of your upper body -- the shoulders, arms and chest -- as well as your lower body -- your glutes, quads, hamstrings and calves. To perform the squat thrust, stand upright, squat and assume a pushup position. Then perform a pushup, bring your feet back under you to return to a squat position and jump as high as you can. When you land, repeat the motion. Squat thrusts can be intense, so you'll definitely want to get something out of them if you perform the exercise. You can use squat thrusts to move toward many goals, such as muscle-building and weight loss. The combination of two major exercises -- the squat and the pushup -- provides a significant stimulus for muscle growth and also results in a high level of calorie expenditure. The squat thrust increases your heart rate, and since it is an aerobic exercise, you can use it for conditioning as well. Jumping jacks are used in settings ranging from grade-school gym classes to basic training for the armed forces. Jumping jacks are much easier to perform than squat thrusts. Stand with your arms down at your sides and your feet together. Jump while separating your legs and bringing your arms up to meet above your head. Reverse this motion and repeat. Cedric Bryant, chief science officer for the American Council on Exercise, notes that performing jumping jacks for as little as 10 minutes at a time can help you stay on track with your fitness plan. Rather than concentrating on a number of repetitions as you would with weights, focus on trying to see if you can lengthen the amount of time you can perform jumping jacks to improve your fitness level. If you're looking to pack on muscle, squat thrusts are the better choice, as jumping jacks are primarily an aerobic activity. Jumping jacks can make an effective starting point for your cardio workouts. 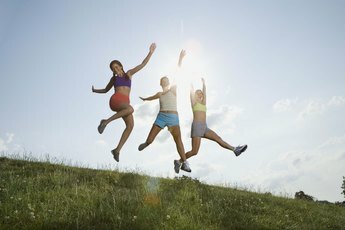 If you're looking to shed some pounds, jumping jacks can help you reach your goals. Jumping jacks are highly efficient at burning calories; a 180-pound person would burn 686 calories per hour doing jumping jacks. Squat thrusts and jumping jacks can be used together to form the basis of an effective full-body cardio and muscle-building routine. Using both exercises will help you get fit by working muscles of your upper and lower body. Additionally, the exercises each provide an intense cardiovascular workout, making them appropriate for sports training and general fitness alike. What Is the Difference Between a Medical Assistant & a Certified Medical Assistant? What Is the Ideal Number of Repetitions During Strength Training for Health Benefits?